Wonton wrappers made with natural kansui (lye water). Simply defrost in the refrigerator and use. 210g total (2 bags, 20 sheets each). Wontons are one type of traditional Chinese dumpling. They are often filled with pork or shrimp, and often come in soup. 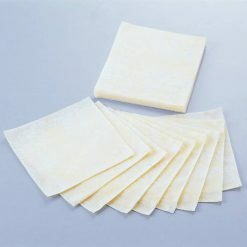 Because our wonton wrappers are made with natural kansui (lye water), they have no smell of ammonia. Each wrapper is 90mm x 85mm, and 0.55mm thick. Making your own wontons at home gives you the chance to fill, season, and cook them exactly as you wish! Whether you like your wontons with just one filling or a mixture of ingredients, whether you like them seasoned or plain, all the choices are in your hands. Since many pre-made wontons contain meat, this is an especially useful option for vegetarians. 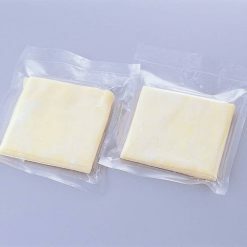 Because these wrappers come frozen, they are easy and convenient to have on hand whenever you need them, with no need to worry about them molding or spoiling. Defrost in bag in refrigerator (about 3 hours).The wrappers dry out easily, so once their bag has been opened they should be used as soon as possible.Wontons made with these wrappers make great snacks, side dishes, or appetizers; and can be eaten plain or with sauce. They can be added to soup for traditional wonton soup, or to a range of other dishes, including salads. The wrappers themselves can also be used in a variety of surprising ways, including to make tiny pizzas or fried snacks! This product contains wheat flour, starch (potato, tapioca), table salt, rapeseed oil, ethyl alcohol, kansui, gardenia colorants, (this product contains soybeans)..